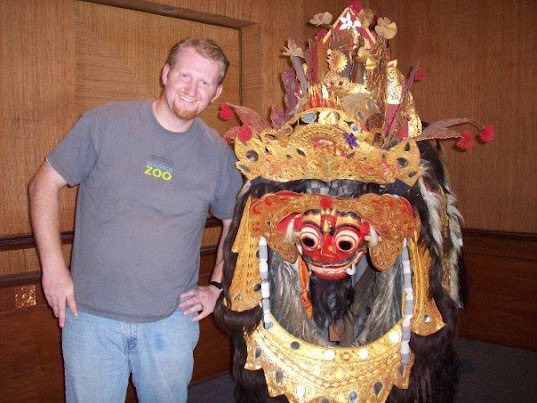 Bali Indonesia Land of Peace and Land of the Monkey King – Traveling Epic! Big surprise on both parts. Monkey jumps on my shoulders and starts picking my face, and pulling my ears. It was so amazing. 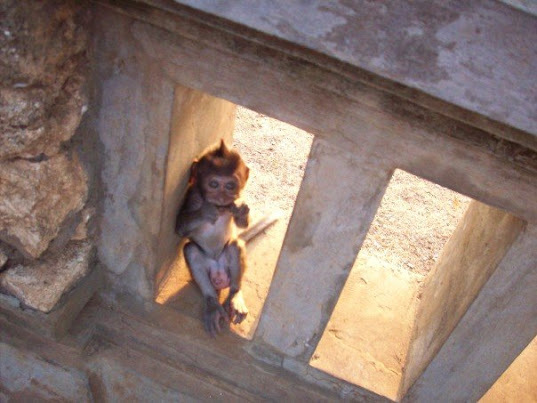 Incredible experience being able to interact directly with the monkeys. You do have to be careful as the monkeys will try to steal your camera or glasses. In the distance you can see the stupas. In the foreground a man gets ready for the Kekak dance which will happen here. This dance is a mix of spiritualism, ritualism, and story telling in a very colorful display. Above: In this particular instance I’m filming the fire dance. The monkey king is mediating as fires rage around him. He wakes up and begins dancing, jumping over the fires of straw. He kicks some of it away from the crowd, but in his trance he miscalculates and kicks the fire into the crowd. If you look closely at his clothing in the picture you can see this his arms are singed. After, I heard one of the people that was burned say it was a bad burn. I had wondered if this had happened very often. Others speculate on the YouTube video that with the noise of the crowd and the trance there was little that could be done. The characters will dress in beautiful colors and the dancing is so beautiful. The story is a from scripture, and has been told for more than a thousand years. On the island, many of the paintings, art, and carvings, tell this story. The hero, the Monkey King. 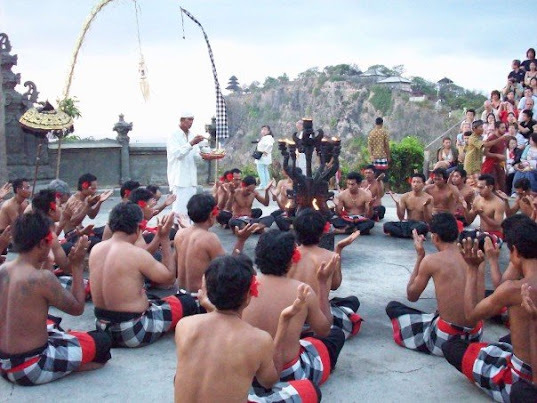 There are many ways to represent the dances around the island the Barong dance, the shadow puppets, the Kecak dance. I hear much of what happens in the play is to tell a story, but to teach the people of good and evil. It teaches of karma. Karma is something I learned more about in real life in Bali than anywhere else. It’s similar to the Christian… do unto others as you’d have them do unto you. Karma provides that bad things will happen to you if you do evil, and if you do good things good things will happen to you. 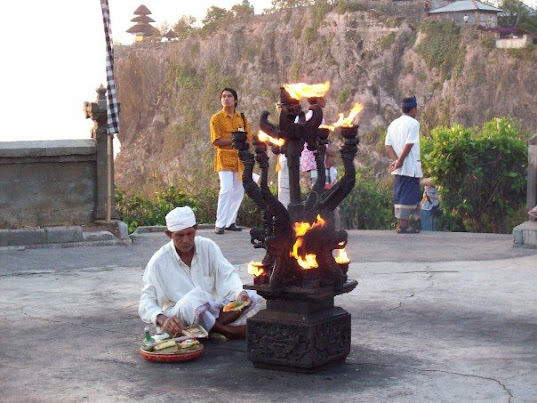 It is carried a lot further in the Balinese society. 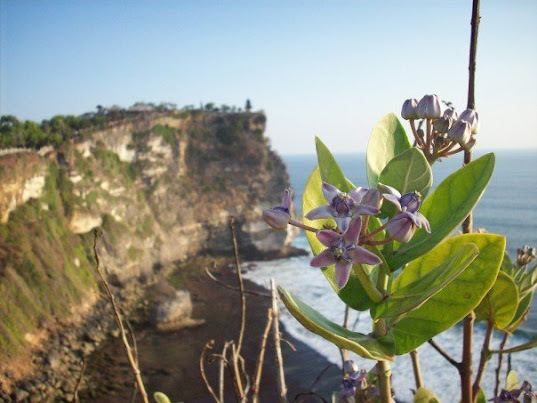 Many on the island feel like the Bali bombing was as a result of the hearts of the people. That it was a punishment. Not just to the foreigners who were killed, but it brought bad karma to the island. These evil people brought a bad spirit. The people are very spiritual. Every home has a temple, a village, a city, each have a temple. Even my hotel had a temple area. Days themselves are known as holy or not. When you get married or have a funeral you want them to land on holy days. I was very impressed to see the banana leaf and flowers that represent the prayer of the gods in protecting them and keeping them safe. This was common to see the prayers over things the people care about. I have since noticed them in various restaurants owned by religious Hindus. 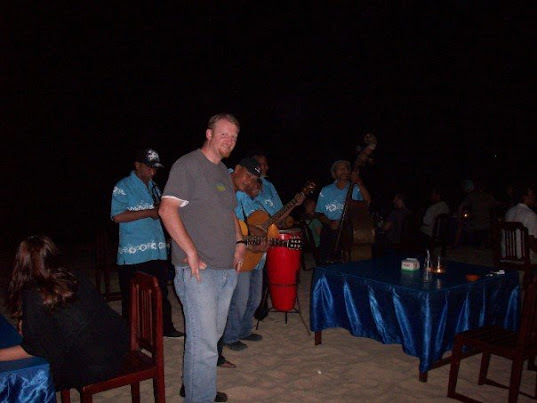 I did gain a great respect for Hindus based on how I was treated on the island. I’ve spend a significant time on the island and in working with Hindus, but there was definitely a special strain on the island that was strong. There is so much to tell about the island. I ended up reading a few books prior to going to Bali. Likely more preparation than any of my previous trips. Mostly because I was so fascinated by the people, the colors, the culture. 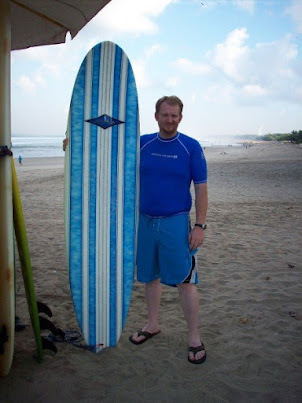 I do recommend going to Bali of course, but when you get there… slow down. Pick some fresh seafood, walk out onto the beach and listen. Invite your tour guide to sit with you. Talk with the locals. They are an amazing people. I remember tell my driver and guide… you should come visit America some time. He replied he would likely never leave the island. Everything he needs is here. He understands something about why it is attractive to us to visit him, but despite what he sees on TV, he is ok with watching from afar. I did meet some Balinese people who work for a cruise line. I told them how much respect I had for their island. How it had changed me. They understood. They had a lot of pride in Bali and couldn’t wait to get home. 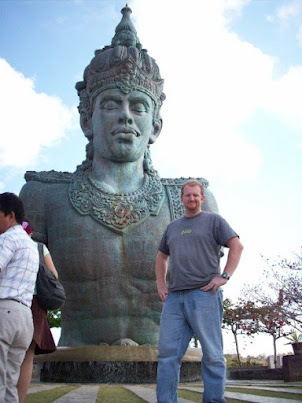 My trip to Bali was one of a few stops. I will blog about Malaysia in another trip, but it’s of great contrast to Cambodia, one on the same trip. I blogged about Cambodia and the Khmer Rouge recently. 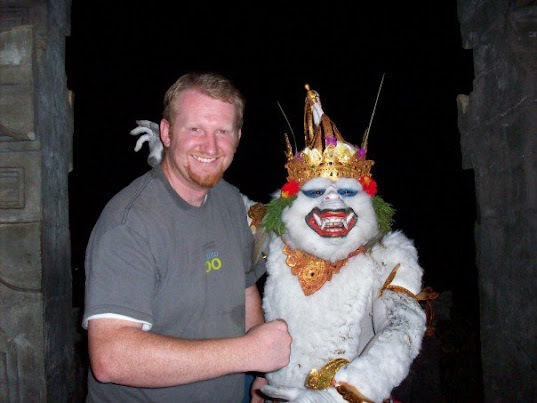 Enjoy this video which includes clips of my trip including the wedding party in Bali. There’s much more I could say about the culture, the fabulous food, the terraced rice patties, the monkey temple (awesome), the massive fruits, the cheap and amazing carvings, the silk, the masks, and jewlery boxes. Once I bought a jewlery box, and in the next 5 minutes I’d end up with a half dozen more based on what I had paid, and based on the stories I would hear of hardship. The sincerity. I wanted to help the people. You will too. Lovely people. I can’t wait to go back.